No, not that one. Cats With Hats is a new full-color independent comic book series written and illustrated by Aynsley King from British Columbia. After a successful Kickstarter campaign, the first issue is out and available now in paper or digital form. “Five cats: Viva, Jinx, Olive, Purrche and Soots. They don’t remember who they are, or why they have hats that grant them the power to change into the animals with powers they wouldn’t have otherwise. Together, these strangers must work together using their new hat powers to piece together their shared mystery all while uncovering the conspiracies in Catsopolis…” That’s what the official web site says. Go check it out! And once again, another animated property that the entire world seems to get except us here in the USA. Cracked (also known some places as Cracke’) is a series of comedic shorts created by Squeeze in Canada. The premise is simple: Ed is a friendly if nervous ostrich. (Don’t ask us why he’s red, or why he appears to have no wings. We don’t know.) Ed is a single dad who is trying to raise his brood of 8 eggs to hatching. Very, very wild hi jinks ensue. 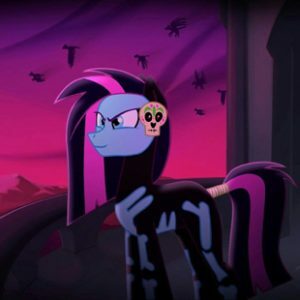 Animation World Network mentioned the series last year, when it was distributed in Australia, New Zealand, Africa, the Middle East, and Continental Europe. Recently they added Japan to the list — but still no mention of the USA. Well, if you visit the Squeeze web site, you can learn more about the series and how to download it as an app. Talk about International! 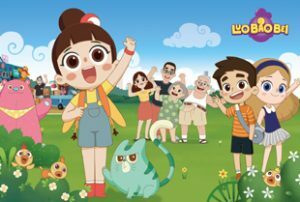 Cloth Cat Animation in Wales and 9 Story Distribution in Canada have teamed up with Magic Mall Entertainment in China to bring Magic Mall’s new animated TV series Luo Bao Bei to the wider world. This is from Cloth Cat’s web site: “The series centres on spirited, fun-loving 7 year old Luo Bao Bei as she explores everyday life with her friends, family and animal companions, having adventures and learning that even though we seem different on the outside, the emotions we all feel make us fundamentally the same. Starting life as a popular cartoon spokesperson and community icon in Beijing, this show is created by Grace Tian.” The head writer for the new series is David Ingham, who is well-known for his work on Shaun the Sheep and The Octonauts. 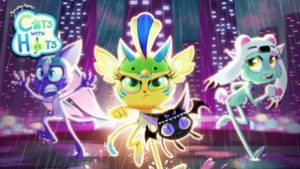 Speaking of MIPCOM, as usual the hey-buy-our-TV-series trade show has given us lots of anthropomorphic animation to hope might make its way to our shores. 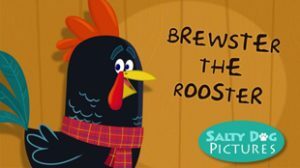 Among them is Brewster the Rooster, created by Salty Dog Pictures and distributed internationally by Monster Entertainment. According to C21 media, “The show… follows the adventures of six-year-old Maggie and her best friend Brewster as they find out the answers to questions only children could think to ask.” Animation magazine has an article from a year ago about this and other interesting projects that Monster has picked up for distribution. 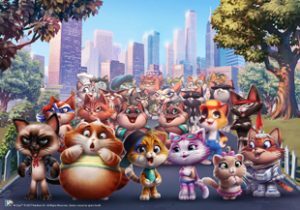 Another one we learned about from Animation magazine: Italy’s Rainbow Studio (home of Winx Club) has teamed up with Canada’s Bardel Entertainment to bring us 44 Cats, a new animated TV series. (The title is based on a very very popular song in Italy.) 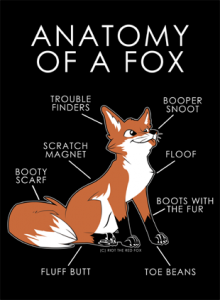 Here’s what the creators say: “The series centers on a group of cats who act normally when thy are around people, but act just like humans when they are on their own. Just like children, the little cats see the world of adult humans as confusing and full of strange rules. Highlighting themes of friendship and altruism, 44 Cats is driven by the main characters’ love of helping others.” Currently the show is at MIPCON, searching for distribution in the wider world. Looks like Amazon has brought us a classic children’s illustrated book series as a new animated TV series for their Amazon Prime service. 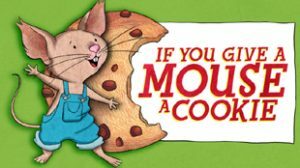 If You Give A Mouse A Cookie (famously written by Laura Numeroff and illustrated by Felicia Bond in 1985) was adapted for animation by Mercury Filmworks in Canada. Show-Runner Joe Scarborough has quite the animation resume’, having worked on shows like Arthur, Doug, Curious George, Pocoyo, and Martha Speaks. This new series follows a young boy named Oliver and his best friend, an adventurous mouse. Their friends are various other kids whose companion animals include a cat, a pig, and even a moose. 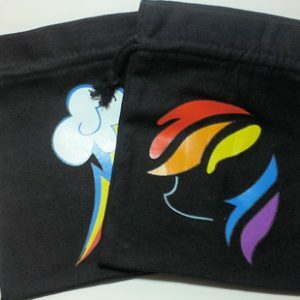 Check out the preview video over at YouTube.